A fun weekend of dancing hosted by Wendy Mumford. There is no need to have experience in both (or either!) types of dances; you’ll be surprised by the similarities – and the differences! Everyone and all abilities welcome; you can brush-up on existing dance skills, while learning new ones completely afresh. We’ve a great team for 2016 – Pat Houghton to teach Scottish Dance, Brian Stanton to lead the Playford, and top musicians Ian and Judith Muir of the Craigellachie Band – so come and make new friends and enjoy a taste of both Playford and Scottish dancing. 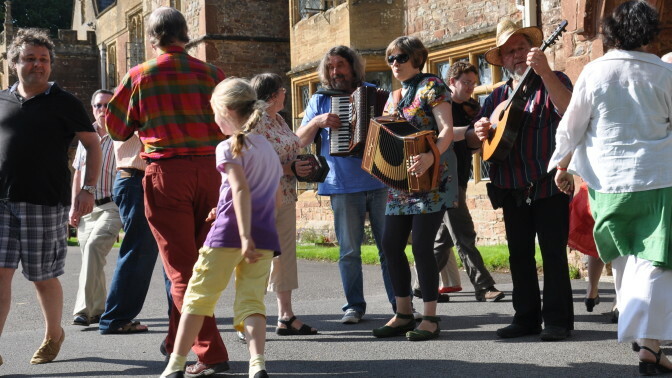 For non-dancing partners – and everyone during free time – the area has plenty to offer; beautiful walks, the West Somerset Railway, pubs, tea shops, galleries, gardens and many hidden treasures in the surrounding villages. There is no need to know how to do both types of dances, you’ll be surprised by the similarities and the differences. Everyone and all abilities welcome. Take part or just watch, whatever you choose; for non-dancing partners – and everyone during free time – the area has plenty to offer. Beautiful walks, the West Somerset Railway, pubs, tea shops, galleries, gardens and many hidden treasures in the surrounding villages. This weekend is hosted by Wendy Mumford, Pat Houghton, (Scottish Dance) Brian Stanton, (Playford) musicians Judith and Ian Muir- come and make new friends and try out Playford and Scottish dancing.